After breakfast at the hotel we pick you up from your hotel by our coach and professional guide. We drive to Sultanahmet square and leave the coach out for walking tour around Hippodrome where is the great place to start understanding Istanbul. The Hippodrome was built by the Romans in about 200 AD and originally used for chariot racing and other public events, and the stadium surrounding the track held over 100,000 people. 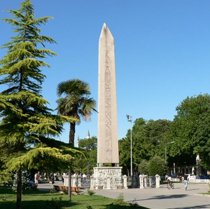 The oldest remaining column is called the Egyptian Obelisk, which was built in Egypt in 1500 BC. Next spiral Serpentine Column, dating back to 479 BC. was brought to Istanbul from Delphi. Blue Mosque is probably Istanbul's most famous landmark, and was built by some of the same stone masons who helped construct the Taj Mahal in India. 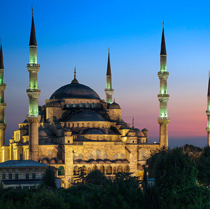 Only mosque with six minarets! Inside is cascading with domes, 250 windows and 20,000 amazing Iznik blue tiles. Hagia Sophia is an architectural intelligence and the first masterpiece in Byzantine architecture was completed in 537 AD. It has been the largest cathedral for 1000 years until the Seville Cathedral was built. 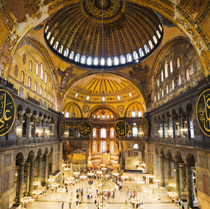 When you enter Hagia Sophia, the vastness of the 105-foot dome towering 184 feet overhead is astounding, especially given that the building was constructed 1500 years ago! We will have stop for lunch at one of the nice local restaurant before walking to Topkapi Palace. 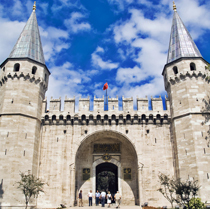 Topkapi Palace was expanded by successive sultans, and remained the sultan's residence for the Ottoman Empire for over 400 years. It has opulent rooms, fine art collections, and peaceful courtyards, and is one of the highlights of the city. The Treasury has exquisite jewels, many of which are embedded in daggers, and also has golden thrones encrusted with precious stones and the 86-carat Spoonmaker's Diamond, the 5th largest in the world, which once adorned the turban of Mehmet IV. Grand Bazaar is one of the largest covered bazaar in the world with its surface of 30.7 hectares, 61 streets, 10 wells, 4 fountains, 2 mosques and over 3 thousand shops. 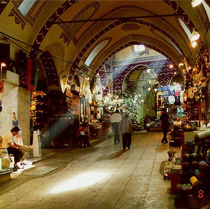 The Bazaar was first constructed in 1464 with the order of Mehmed II 'the Conqueror'. This is a real fun to stroll around the bazaar and explore small and humble shops which offers you lots of beautiful souvenir items both traditional and trendy as well as carpets, leathers. At the end of tour in the afternoon, we return to your hotel.